The Foothills Sentry issue for February 2017 covered the opposition to the Steve Sheldon proposed project in Cowan Heights. The proposed project would be double the minimum allowed density per the zoning code. Following is the lead front page story. Following the lead story are letters to the editor and then a Guest Commentator Column by Richard Nelson. Rally organizers Jenny Benford and Christina Nickel said the goal of this, and future rallies, is to urge residents of North Tustin to sign a petition opposing rezoning of a 4.4-acre parcel at the southeasterly side of Newport Boulevard across from Kings Bridge Road in Cowan Heights. “We hope to inform the community about what’s going on,” said Benford. Due to density issues and the tract’s proximity to Newport Blvd., the North Tustin Advisory Committee (NTAC) voted unanimously, in December, against a zone change. NTAC functions as an advisory committee to the Orange County Board of Supervisors. According to Benford and Nickel, they plan to hold rallies on Newport Blvd. at 7:30 a.m. every Thursday until this plan is defeated. 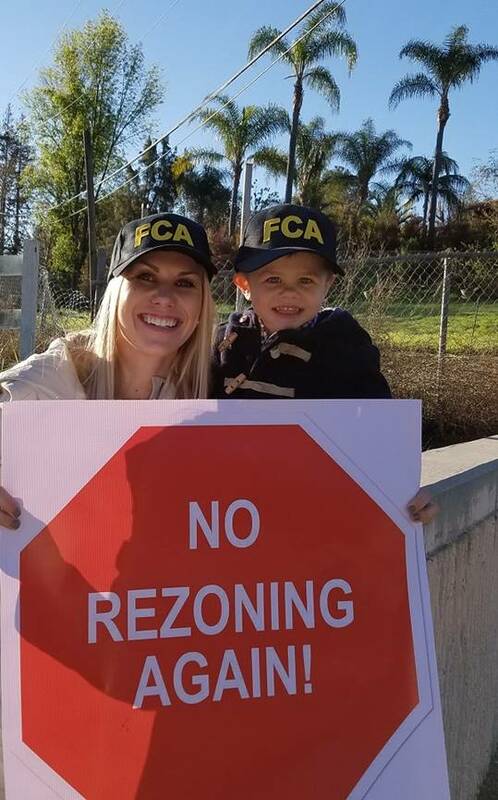 They urge neighbors of the proposed project, not just those in Cowan Heights, but impacted residents in Rocking Horse Ridge and Santiago Hills, to sign FCA’s petition at fcahome.org. I am writing to express my strong opposition to the proposed 22-house development on Newport Avenue in Cowan Heights. I recently moved to the area with my family after searching for many months for an area that fit with what we had envisioned for our family; a quiet, semi-rural feel with large lots, custom homes and lots of space. We found this in Cowan Heights and made a large financial investment to live here. Allowing this development to move forward, as currently proposed, would be an insult to the existing homeowners and lower their property values while lining the pockets of the developer and seller. The current zoning is in place for a reason and craming 22 homes in an area zoned for about eight homes is simply wrong. This will degrade the character of Cowan Heights and open the door for future developments of this nature. I will do everything in my power to keep this project from moving forward as currently proposed and I know there are many residents who feel the same. An article in your January issue described the proposed Sheldon development project in Cowan Heights, and its failure to receive approval from the North Tustin Advisory Committee (NTAC). I was at that meeting and applaud the NTAC group’s unanimous decision. This project, which would require a zoning variance, is incompatible with the Cowan Heights community, cramming many homes on smaller lots — roughly one-quarter acre — into an area with half-acre zoning. Most of the adjacent homes are on properties that are at least a half-acre and many are substantially larger. I think everyone would support development on that property — or any property in North Tustin — so long as the developer plays by the rules. The requested variance, instead, tries to change the rules all the rest of us have abided by, solely for the benefit of that developer. In fact, not only do the rest of us not share in that benefit — we fear that our own properties will be penalized in the future, and lose value, if the Sheldon project is built. North Tustin is a special place, and we want to keep it that way. Accordingly, the community has formed a group to oppose this, No Rezoning – Again!. You’ll see our weekly rallies shortly on Thursday mornings, on Newport, in front of the site. Join with us! You can sign our petition on the www.fcahome.org website, and you’re welcome to join a rally. Free coffee! 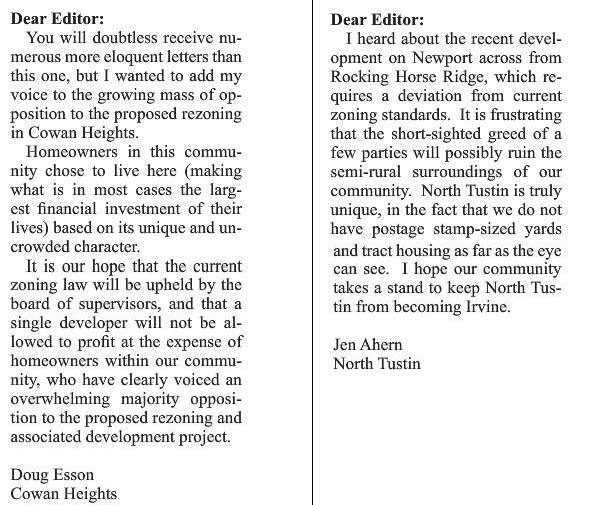 I am writing to say that I am opposed to the rezoning on Newport Blvd. and the Sheldon development. My husband Gary and I are opposed to the Sheldon development. No rezoning. I am opposed to the Sheldon project. I believe it does not bring value to our community and the re-zoning is a detriment to our community. I am opposed to the zone change proposed for the Sheldon project. I believe it is not consistent with the surrounding area. I also do not think that zoning changes should be allowed just so that a developer can purchase land, change agreed upon use, build a project, and make a profit without regard to the current homeowners objections. Then leave the current residents to deal with long term issues created while they just move on to the next profit center. They have no long term commitment to the betterment or benefit of the community. I’m opposed to the Sheldon development. No re-zoning! I am writing this letter in opposition of the Sheldon Project that is being proposed off of Newport Ave. The proposed lot size would require rezoning. I am in opposition to that as well. I have lived near Newport and Foothill for 35 years and greatly appreciate the zoning laws that exist to protect our community. I oppose the development. We moved to Lemon Heights for its relative rural community and feel we should have rights also to preserve our neighborhood. Please do not allow a developer to build homes on a smaller lot that is currently required. I live in Lemon Heights and want the current lot size requirements to remain! I am opposed to the Sheldon project. Please take into consideration our community and the impact this would have on it. 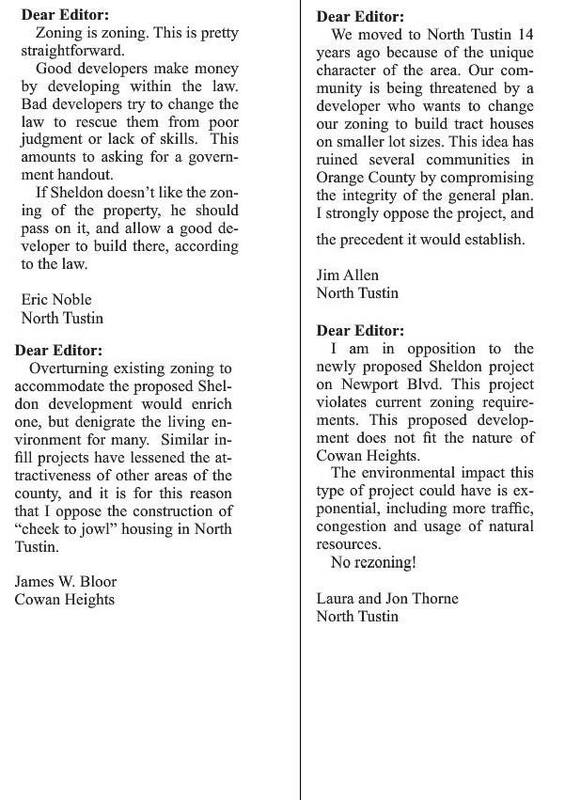 Please no re-zoning in North Tustin! I am sure you will receive many more informative and eloquent letters on this subject and I hope you will publish them. 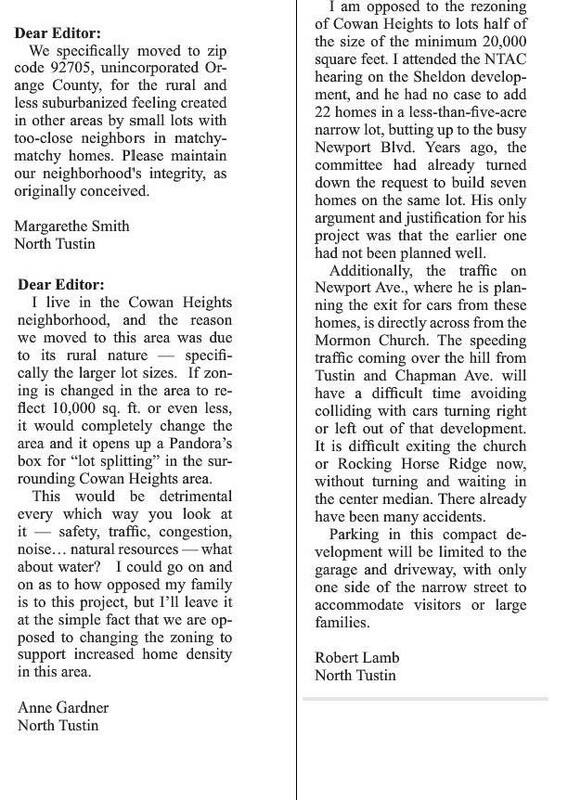 I just wanted to voice my objection to the proposed Sheldon high-density housing project in Cowan Heights. This will potentially lower my property values (as a Cowan Heights resident) and it will certainly increase crowding, traffic, pollution and demands on infrastructure. There is no up side to this project, and I know of no one who supports it. I am opposed to the Sheldon Project. We live here for a reason. No zoning changes! What a can of worms. Next thing you know my next door neighbor might sell to someone who will try to divide the lot into three parcels and build three houses on it. No exceptions! Ever. I would like to share that I and my family are opposed to the Sheldon project because I don’t want to see re-zoning in North Tustin. Zoning was already determined and it shouldn’t be changed from low density. As residents of Rocking Horse Ridge II, we are concerned the proposed Sheldon Project to rezone the land to build numerous homes on smaller lots will impact the area and add to an already busy Newport Avenue. My husband and I bought here because of the rustic feel of the area and bigger lots. It is difficult making left turns out of our complex due to the blind curve just north of the footbridge with cars traveling at high speeds. Rezoning the area to build the proposed number of homes will increase the likelihood of more frequent accidents and change the landscape of our foothill area. Our family and our neighbors strongly oppose rezoning and the Sheldon development that is clearly inappropriate for our community and property value. 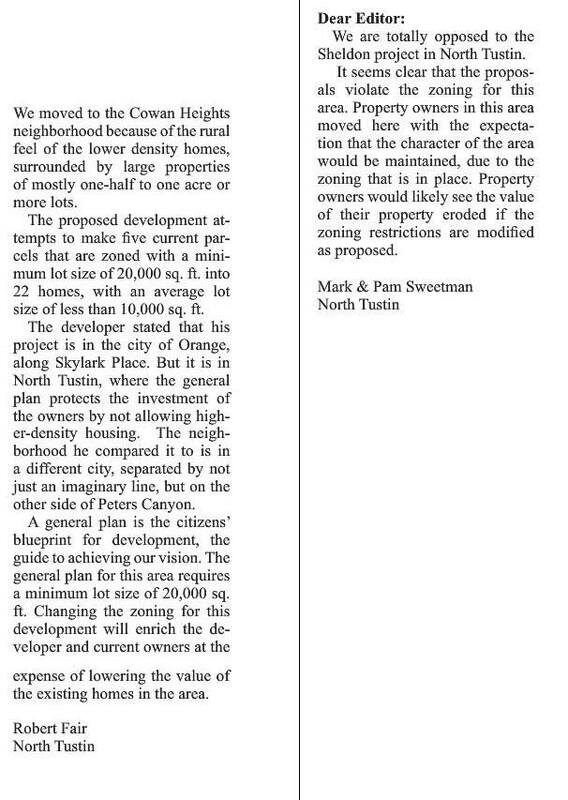 We’re currently facing an attempted zoning variance in North Tustin, for the benefit of a property owner and a developer, exercising what they believe are their property rights. This proposal, for the property in Cowan Heights, across from Rocking Horse Ridge along Newport Boulevard, would deviate from the minimum 20,000-sq.-ft. (approximately one-half acre) lot size for which this property, and the surrounding community, is zoned, and instead create 22 lots with approximately one-fifth to one-quarter acre lot sizes. Property rights are important – beginning with our own. 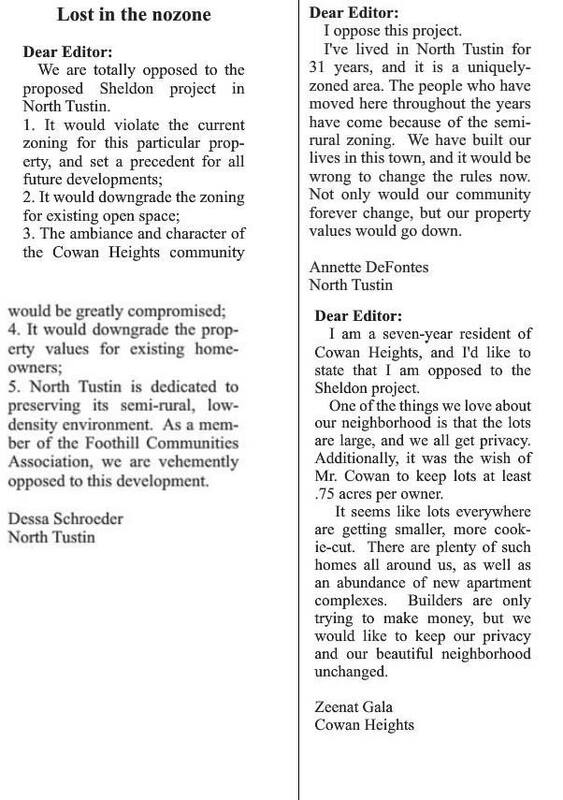 The Foothill Communities Association (FCA) is opposed to this requested change because it does not support our property rights, as homeowners in the North Tustin community. One very desirable attribute of North Tustin is the availability of larger lots. If a homeowner wants that attribute, it is currently available. That desirable attribute will be negatively impacted if developers can downgrade the zoning of every piece of property. Once lost, it cannot be recovered. Zoning exists to protect your property values. It’s a promise from local government that we trust and rely on when making, for most of us, the largest financial commitment of our lives. And more, these are our homes, the places where we live, raise our families, and retreat from the noise and chaos of the outside world. And yes, their financial value is an important entry in our personal balance sheets. Zoning modifications that break trust with community residents who relied on the existing zoning as part of their purchase decision should not be allowed. Individual property owners should be allowed the maximum freedom allowed by the law to manage, enjoy and dispose of their property as they see fit – so long as those decisions do not adversely impact the other property owners in their community. If someone wants to develop that property, fine – just play by the rules. If this change is granted, we would see the smallest lot sizes ever permitted in Cowan Heights, a resulting increase in density and traffic, and the creation of a planned development that is not in keeping with the existing zoning and character of the Cowan Heights community. We believe it would make the community a less desirable place to live and lower other property values. The change would benefit the property owner/developer – but at our expense. That amounts to a gift of public funds – money taken from your pocket and placed in theirs. From the 1960s, the Foothill Communities Association has worked to preserve the highly valued living environment we share in North Tustin. Among the key underpinnings of that environment are our specific plans and the zoning regulations that protect the rights of all of us. This requested variance interferes with our property rights. For that reason, the FCA Board of Directors voted unanimously to oppose this project. We urge you to do the same. Make your opposition known by signing our “No Rezoning – Again!” petition on the FCA website, fcahome.org. Richard Nelson is president of the Foothill Communities Association.